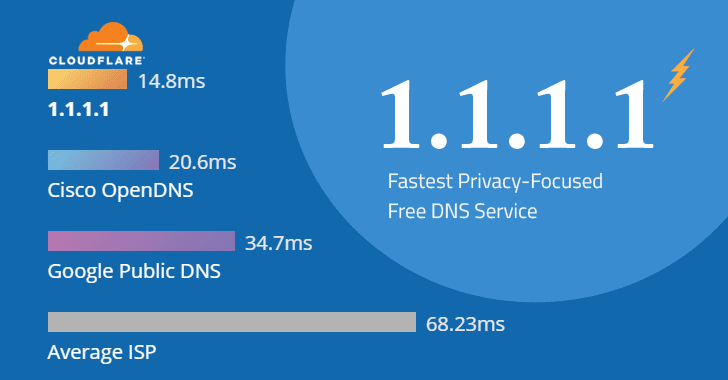 Cloudflare, a well-known Internet performance and security company, announced the launch of 1.1.1.1—world's fastest and privacy-focused secure DNS service that not only speeds up your internet connection but also makes it harder for ISPs to track your web history. For example, when you try to open a website, say thehackernews.com, your DNS looks up for the IP address linked to this domain name and load the site. Since the default DNS services provided by ISPs are often slow and insecure, most people rely on alternative DNS providers—such as OpenDNS (208.67.222.222), Comodo DNS (8.26.56.26) and Google (8.8.8.8), to speed up their Internet. But if you use Cloudflare new 1.1.1.1 DNS service, your computer/smartphone/tablet will start resolving domain names within a blazing-fast speed of 14.8 milliseconds—that's over 28% faster than others, like OpenDNS (20.6ms) and Google (34.7ms). Even if you are visiting websites over HTTPS, DNS resolvers log every site you visit, making your ISP or 3rd-party DNS services know about everything you do on the Internet. "That means, by default, your ISP, every wifi network you’ve connected to, and your mobile network provider have a list of every site you’ve visited while using them," the company says. However, Cloudflare has changed this game with its new free DNS service, which it claims, will be "the Internet's fastest, privacy-first consumer DNS service," promising to prevent ISPs from easily tracking your web browsing history. Cloudflare public DNS resolvers, 1.1.1.1 and 1.0.0.1 (as alternate DNS server for redundancy), support both DNS-over-TLS and DNS-over-HTTPS to ensure maximum privacy. The company has also promised not to sell users’ data, instead to wipe all logs of DNS queries within 24 hours. It's also working with auditors at KPMG to examine its systems and guarantee it's not actually collecting your data. Search for DNS Servers and tap it. Click the + button to add a DNS Server and enter 1.1.1.1 and 1.0.0.1 (for redundancy). Tap Start and then click on Control Panel. Click on Network and Internet, and then tap Change Adapter Settings. Right-click on the Wi-Fi network you are connected to, then click Properties. Select Internet Protocol Version 4 and click Properties, and then write down any existing DNS server entries for future reference. Click OK, then Close, and Restart your browser. Connect to your preferred WiFi network. Enter your router’s gateway IP address in your browser. Fill in your username and password, if asked. In your router’s configuration page, locate the DNS server settings, and enter any existing DNS server entries for future reference. Note: Android requires a static IP to use custom DNS servers. This setup requires additional setup on your router, affecting your network’s strategy for adding new devices to the network. Cloudflare recommends configuring your router’s DNS instead, which gives all devices on your network the full speed and privacy benefits of 1.1.1.1 DNS. From your iPhone's home screen, open Settings. Open Wi-Fi and then your preferred network in the list. Tap Configure DNS, and then click on Manual. If there are any existing entries, tap the - button, and Delete next to each one. Now, add 1.1.1.1 and 1.0.0.1 (as alternate DNS server for redundancy) to the DNS address. Now, tap the Save button on the top right. You’re all set to go! Your device now has faster, more private DNS servers.